The Agilent Technologies E8285A CDMA/PCS mobile station test set provides CDMA mobile phone manufacturers with increased measurement speed, improved accuracy, and flexibility to increase test throughput and product quality. Built from the industry standard Agilent Technologies 8924C, the Agilent E8285A offers proven performance and reliability with increased capabilities for manufacturing all current types of TIA/EIA-95 based CDMA mobile phones in a single test set. The Agilent E8285A additionally provides flexible base station emulation and a large set of capabilities which enables CDMA mobile phone designers to produce high quality designs in less time. With the addition of the Agilent 83217A dual-mode mobile station test software, the Agilent E8285A becomes an easy to use automated test system capable of quickly testing dual-mode CDMA mobile phones for incoming inspection, customer return testing, and depot level repair applications. The Agilent E8285A includes high performance cellular CDMA and PCS CDMA, and cellular AMPS, NAMPS, TACS, NTACS, and JTACS analog phone test capability. 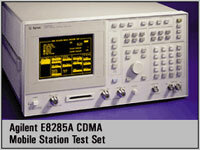 Based on the full featured capabilities of the Agilent 8924C CDMA mobile station test set. With the press of a single button, the Agilent E8285A automatically handles the complex, over-the-air call processing required to make a CDMA or analog phone call. For call processing verification, the Agilent E8285A supports both mobile and base station initiated call connect and disconnect. Once a call is established, verifying the overall functionality of a CDMA mobile is easy, fast, and accurate using the Agilent E8285A's extensive set of functional and parametric test capabilities. The E8285A offers eight user selectable protocol stacks: IS-95, IS-95A, TSB-74, ARIB-T53, Korean PCS, J-STD-008, TIA/EIA-95B as well as multi-mode which allows handoff between the CDMA PCS and CDMA cellular bands. Industrial Resources, 5370 E. Hunter Ave., Anaheim, CA 92807. Tel: 714-701-1520; Fax: 714-701-1535.